This is the place for all you Roger McGuinn and BYRDS fans. You will find a lot of pics and information about Roger´s gear from today and the past here - enjoy ! For the classical clean "jingle jangle" sound at almost unity gain, the BSM RMG is the perfect pedal. If you need a tad more dirt with a fantastic sounding bass, the BSM VX-C Classic is for you. After you tried the tone pot of this pedal, you will ask yourself how you could live without it until now. If you are looking for "jingle jangle" high-gain sounds, get the BSM VX-T to taylor your needs. This pedal is also the right choice for modern Country Rock. 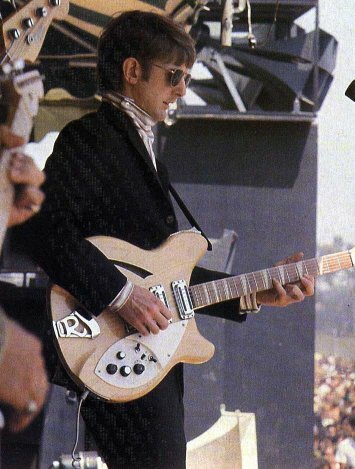 Roger McGuinn, playing with the BYRDS in 1968 on his famous 12 string Rickenbacker guitar. 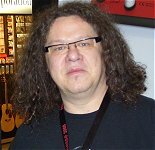 His unique sound is partly created with a special playing technique. As a original Banjo player, he plays with the thumb and 2 fingers on the 12 string Rickenbacker. The Rickenacker 370/12 with the "maple-glo" finish is Roger´s favorite guitar. Before 1967, he played two Rickenbacker 360/12 models, both of them were stolen. In 1967 during a Rickenbacker factory tour, the 370/12 was developed to taylor Rogers special needs and wishes. Rickenbacker "Toaster" singlecoil pickups. They are loaded with six AlNiCo 5 magnets, each of them 6.35mm thick and 19mm long. Aprox. half of the length, is stucking out of the bottom of the pickup, the pickup itself is really flat. The pickup routings of the Rickenbacker guitar have corresponding deepenings on the bottom to make the pickups fit. The winding itself has a height of only 5mm, aprox. the half of a normal Strat pickup ! A real thin 0.05mm CuL wire is used for the windings. Because of the flat and wide winding, the spool-constant is larger, compared to a normal Strat pickup. This is the reason, why this pickups have 2.3 H and 7.2 kOhm with only 5000 windings. 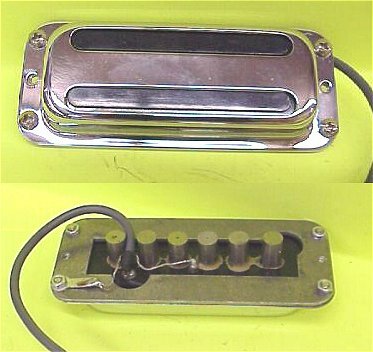 After 1969/70 these pickups were replaced by the socalled "hi-gain type" pickup with six iron pieces as polepieces, a ceramic magnet and more windings. These pickups are not recommended, if you are looking for the real Roger McGuinn sound.